Donald Trump continued with his criticism of Iran as he visited Jerusalem as part of his tour. 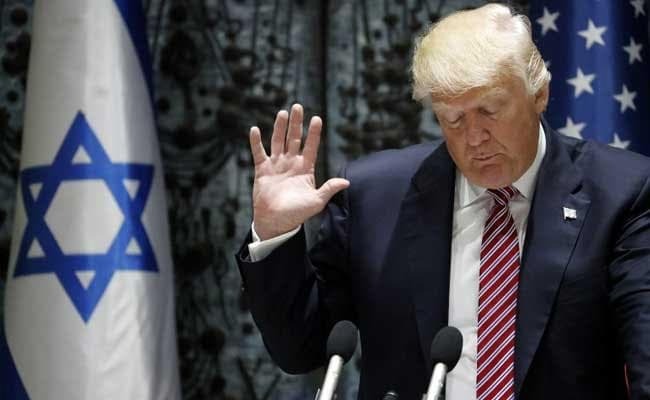 Jerusalem: US President Donald Trump travelled to Jerusalem on Monday to seek ways to achieve Israeli-Palestinian peace, but also used the visit to again lash out at Iran. Trump's visit is part of his first trip abroad as president and follows an initial stop in Saudi Arabia, where he urged Islamic leaders to confront extremism while also criticising Iran. He later travelled by helicopter to Jerusalem and, in remarks at Israeli President Reuven Rivlin's residence, launched his latest salvo against Iran. "The United States and Israel can declare with one voice that Iran must never be allowed to possess a nuclear weapon -- never ever -- and must cease its deadly funding, training and equipping of terrorists and militias," Trump said. "And it must cease immediately." While in Saudi Arabia, Trump accused Iran of fuelling "the fires of sectarian conflict and terror" while calling for its international isolation. Security was extremely tight for the Israeli leg of the visit, with police deploying some 10,000 officers. The alleys and passageways of Jerusalem's ancient Old City, which Trump visited later in the day, were essentially under lockdown. Ahead of talks with Netanyahu, Trump was touring two iconic sites in Jerusalem, a city holy to Muslims, Christians and Jews. The first was the Church of the Holy Sepulchre, built at the site where Christians believe Jesus was crucified, buried and resurrected. He could be seen entering the holy site along with first lady Melania Trump under heavy security. Afterwards, he is expected to become the first sitting US president to visit the Western Wall, the holiest site where Jews can pray and located in east Jerusalem. Trump will meet Netanyahu at 6:00 pm (1500 GMT). Ahead of their meeting, Netanyahu's security cabinet adopted a series of measures aimed at benefiting the Palestinian economy, moves seen as confidence-building measures requested by Trump. They reportedly included new building permits for Palestinians in the part of the West Bank entirely under Israeli control, which occurs only rarely. Most of the West Bank is under complete Israeli control and Palestinians face extremely long odds in being granted building permits in those areas, while Israeli settlement building has meanwhile continued. "On my first trip overseas as president, I have come to this sacred and ancient land to reaffirm the unbreakable bond between the United States and the state of Israel," Trump said at the airport after arriving. He said later: "We have before us a rare opportunity to bring security and stability and peace to this region and to its people, defeating terrorism and creating a future of harmony, prosperity and peace." On Tuesday, Trump will meet Palestinian president Mahmud Abbas in Bethlehem in the West Bank, visit the Yad Vashem Holocaust memorial in Jerusalem and give a speech at the Israel Museum. Any leader would face an enormous challenge in seeking to bring the Israelis and Palestinians together for meaningful talks, and Trump's inexperience and domestic political struggles will only add to it. He has spoken of his self-described deal-making prowess in declaring that the "ultimate deal" is possible, vowing "we will get it done". Trump has sent mixed signals about how he will approach the Israeli-Palestinian conflict. He cast uncertainty over years of international efforts to foster a two-state solution when he met Netanyahu at the White House in February. At that meeting, he said he would support a single state if it led to peace, delighting Israeli right-wingers who want to see most of the West Bank annexed. At the same time, he urged Israel to hold back on settlement building in the West Bank, a longstanding concern of Palestinians and much of the world. Trump advocated during his campaign breaking with decades of precedent and moving the American embassy from Tel Aviv to Jerusalem, deeply alarming Palestinians. Trump's seeming openness to at least some of Abbas's concerns has given Palestinians more reason for hope than many may have expected, but still reason to remain wary, some analysts say. On the Israeli side, Netanyahu heads what is seen as the most right-wing government in the country's history, and members of his coalition were elated with Trump's election. Some even called for an end to the idea of a Palestinian state. Trump's actions since have left them disappointed, with the embassy remaining in Tel Aviv -- at least for now -- and the White House seeking to restart peace efforts. However, the United States remains Israel's most important ally, providing it with more than $3 billion in defence aid annually. After Israel and the Palestinian territories, Trump will head to the Vatican along with Brussels and Italy for NATO and G7 meetings.